While our brands, such as Cannon Safe and Stack-On Products may be familiar, Alpha Guardian may not ring any bells. We understand that we seem like the new kid on the block, but in actuality, we’re composed of the premier brands in the home safe and secure storage marketplace. 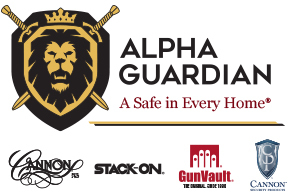 Formed by the acquisition comprised of Cannon, Inc., whose brands include Cannon Safe, Cannon Security Products and GunVault, and Stack-On Products, whose lines of secure storage and organization products are no stranger to the marketplace, Alpha Guardian combines these brands into a safe and secure storage powerhouse. Alpha Guardian has positioned itself to be the category champion and a full solution in the safe, vault, and secure storage industry. With industry-leading brands dating back to 1965, they all come together day in and day out to help the company reach its goal of “A Safe in Every Home.” Alpha Guardian champions the ability to offer a robust portfolio of products including home safes, quick access gun vaults, security cabinets, and garage storage and organization. From the largest of home safes to small, portable locking storage, Alpha Guardian brands are positioned to solve consumers’ needs for safeguarding their important items. While not everyone has gold dubloons or the crown jewels to protect, everyone has something they value and want to protect. Our variety of innovative, easy-to-use safes and cabinets fit easily in any consumer’s lifestyle and helps provide peace of mind that their valued items are safe. From money or jewelry to wills and passports to photo albums and cherished heirlooms, every one of your consumers have valuables to protect, and at Alpha Guardian, it’s our mission to do just that. Cannon Safe has provided superior quality large scale home safes since 1965. Stack-On has more than 40 years of success in the manufacturing and distribution of home safes, firearm safes, and garage storage and organizational products. Founded in 1990, GunVault is the leader in quick access safes for firearms and personal valuables. Since 2010, Cannon Security Products has provided innovative and stealth security products such as wall safes.